A unique face wash developed scientifically using precious herbs with natural Vitamin E which deep cleanses the skin, makes skin glow and visibly fairer. 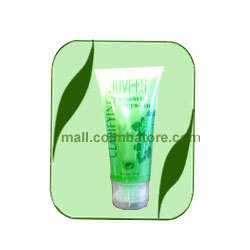 It also removes excessive oil from the skin without disturbing the natural balance of the skin. Recommended for all skin types. Moisten face, squeeze out a small amount on your palm. Massage gently on the face and neck. Rinse well and pat dry. Extracts of Grape seed, Aloe Vera, Olive, Orange Peel ext & Vitamin E.